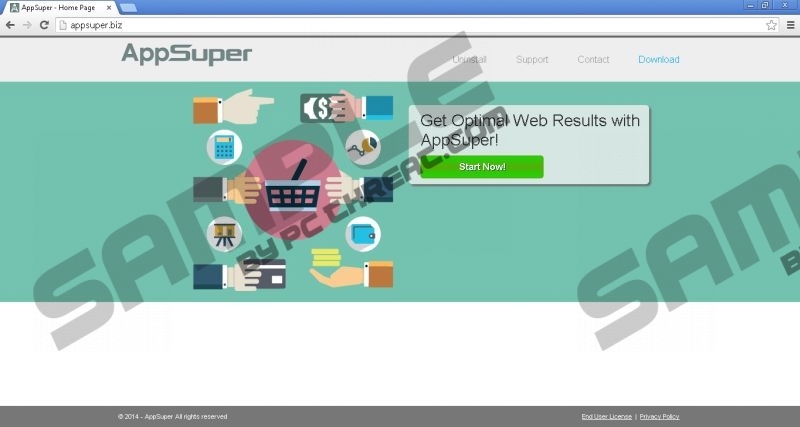 AppSuper is another program published by Super Web LLC, which creates various advertising-supported applications. As it is rather clear from its name, this application will just flood your Internet Explorer, Google Chrome, and Mozilla Firefox browsers with commercial advertisements. It seems that these ads are very intrusive, which means that they might disrupt your browsing session. In addition, there is also a possibility that you will infect your computer via ads that AppSuper is going to generate; thus, we suggest that you delete this program and do everything that it takes in order not to allow it enter your system again. It is possible to remove AppSuper via Control Panel; however, you can still use the instructions provided below the article if you do not feel competent enough. Even though AppSuper promises to enhance browsing experience and even help you to save some money and time while shopping online, you should still not keep this program on the system because it is not going to do anything good for you. If you have ever encountered other Super Web LLC applications, for instance, Cling-Clang, MossNet, Gooternet, and the like, you will know that it is not worth keeping AppSuper as well. If you decide to remove this program, you will definitely reduce the possibility to infect your system with malware. Besides, you will be able to browse the web without any interruptions again. You should not postpone the removal of AppSuper because this program collects data about your browsing behavior. Besides, it might connect to the internet without permission and send all the collected information to third-party advertisers. If you wonder why they need some of the information about your activities on the web, you should know that all the advertisements that will be provided for you will be based on your interests. Of course, it is one of the tactics to lure you into clicking on ads; however, you should know that you have to ignore them completely in order to keep your system safe. AppSuper can be deleted easily and quickly via Control Panel; you can also use the instructions provided below in order to remove this adware manually. However, keep in mind that there might be other infections hiding on your system as well, which is why it is obligatory to scan the system with an antimalware scanner. SpyHunter is one of those tools that can detect infections easily and quickly, so we recommend using it. Locate the application that should be removed. Quick & tested solution for AppSuper removal.